CRISP invites offers from the reputed agencies providing bus services on hire to send their rates per day per to and fro round under Annual Rate Contract. 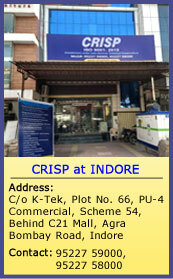 Terms and conditions governing the required services may be seen on our website: www.crispindia.com. Sealed covers containing your quotations shall be received at CRISP counter by registered post / speed post by 5:00 p.m. on 29th November, 2016. CEO, CRISP reserves the right to reject any or all quotations without giving any reason thereof.